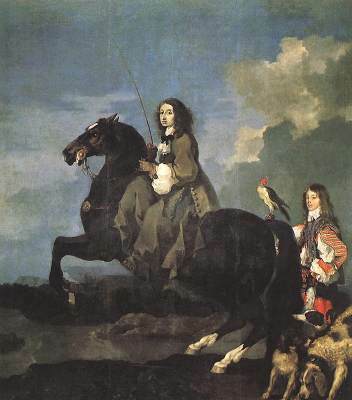 Queen Christina of Sweden on Horseback, by Sebastien Bourdon (1653). Museo del Prado. Christina certainly was clever. Her father ordered that she be educated like a prince, so alongside her studies, which included languages like Hebrew and Arabic, literature, history, art, and ballet, she practiced hunting, riding, and fencing, and studied war tactics. She was allowed to sit in on government meetings from the age of fourteen. Later in life, she admitted that she had never been interested in “everything that women like to talk about or do,” and found it hard to be feminine. She preferred to wear men’s clothing when she could. People who knew the young princess found her charming, witty, and intelligent. Christina’s father died when she was six, and she became queen-elect of Sweden. A council governed in her name until she came to power at the age of eighteen in 1844, although she wasn’t crowned for another six years. Christina was young, but knew her own mind. Although the council advised her not to end a war between Sweden and Denmark, the queen pursued and won peace, and Sweden began to flourish. The queen also defied her advisors by refusing to marry, concerned about handing over her power to a husband. In fact, if she lived today, Christina would probably consider herself a lesbian. She had several intense relationships with other women, but doesn’t seem to have been interested in men at all. She was committed to making Sweden the artistic and cultural capital of Europe and tried to tempt great thinkers and artists to her court, although it never really worked. Not long after she was officially crowned in 1650, Christina considered converting to Catholicism. This was a problem for her advisors: the official religion of Sweden had to be the religion of the monarch, and no one wanted to convert the entire country to Catholicism. After ten years of ruling Sweden, the queen abdicated in 1654, handing over the throne to her cousin, Charles Gustav. Against protocol, she reached up and took off her crown herself, signaling that she had chosen to give up her power. Christina retired at the age of 32. She wasn’t quite ready to be done with ruling, however. After visiting the Pope in Rome, she made a plan to join with the French and take over Naples as its queen. This plan fell apart when she had a servant killed as a traitor, shocking the French court. She lived out most of her life in Rome, where she was an enthusiastic art collector and a close friend of musicians like Scarlatti and Corelli, as well as the sculptor Bernini. She continued to use her influence for good, protecting the city’s Jewish population from threats and humiliation.